Bianca Andreescu (Mississauga, ON) was looking to make a semi-final appearance for a third consecutive tournament on Friday at the Tevlin Challenger. 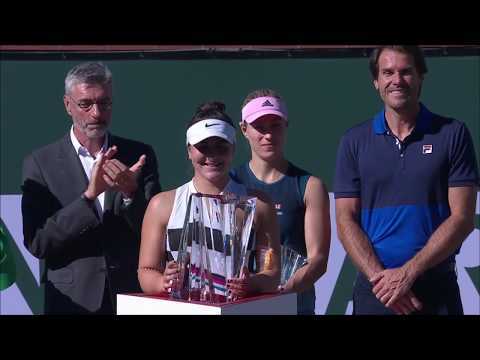 After winning the title at a tournament in South Carolina and then reaching the semi-finals at the Saguenay National Bank Challenger, Bianca Andreescu is currently on a very successful streak of results. Hoping to replicate her accomplishments from the past two weeks, she was in quarter-final action against Robin Anderson of the United States on Friday. The Canadian won their only other encounter, two weeks ago in the quarter-finals in South Carolina. On Friday, Andreescu put on a strong performance, notably with her service game as she totaled six aces in the match. After taking the opening set, play was tighter in the second, where the Canadian showed resilience, battling back from 1-5 down in the tiebreaker. She needed a little over two hours to move past her opponent, taking the match by a score of 6-4, 7-6(5). Up next for Andreescu will be Quirine Lemoine of the Netherlands, who defeated the young 15-year-old Ukrainian Dasha Lopatetskaya 6-0, 2-0 ret. The two will be facing off in the semi-finals for a second consecutive week, as Lemoine was victorious in Saguenay after Andreescu retired from the match in the second set. The other semi-final will feature the tournament’s top seed Kateryna Kozlova of the Ukraine and Jessica Ponchet of France, the sixth seed. For a second straight week, Sharon Fichman (Toronto, ON) and partner Maria Sanchez of the United States will be competing for a chance to lift the doubles’ title. The pair was victorious in their semi-final match, overpowering the Romanian team of Elena Bogdan and Alexandra Cadantu by a score of 6-3, 6-4. Fichman, the former world no. 48 in doubles, is playing in only her sixth tournament in over two years, with her last doubles title dating back to 2016. Standing in the way of her fourth doubles title in Toronto are Maja Chwalinska of Poland and Elitsa Kostova of Bulgaria, who ousted the top seeds to reach the final.